Six months ago, this hospital had no running water. Handwashing was not a routine practice. Water was carried up the hill by bucket so that surgical instruments could be washed and sterilized. 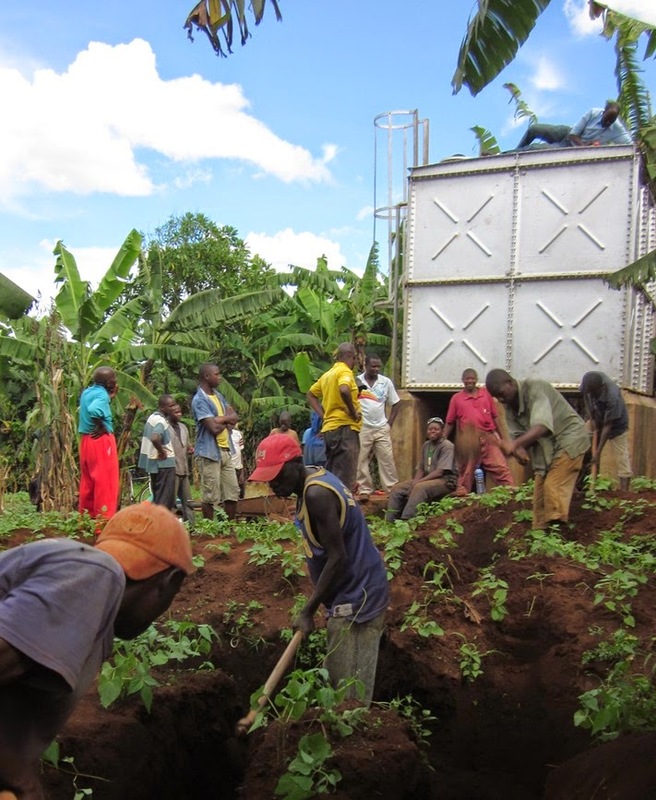 The water came from a nearby spring which provided about 40,000 L per day for the entire community, including 15 community taps, the hospital, and the hospital staff housing. Water shortages and outages were a frequent occurrence. In February of last year, an Engineering Ministries International assessment team evaluated the water needs and water distribution options. The team determined that a well the hospital had drilled was capable of pumping about 192,000 L per day, which could meet the expanding needs of the hospital campus and the surrounding community for many years. A few months later a second team developed a master plan for the long range development of the hospital, including a plan for the water distribution system. Some generous donors stepped up to meet the financial needs for the water system. 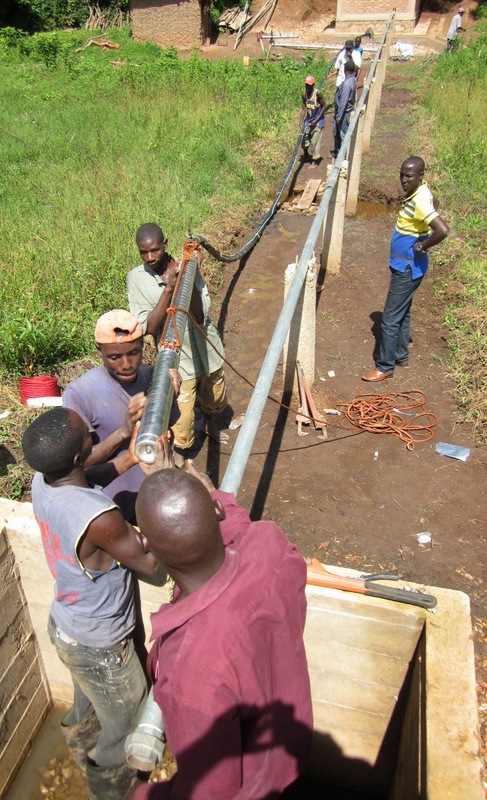 Earlier this year, Gaspard Ndikumana, the project leader for construction of the new water system, arranged for dozens of local men to dig the ditches, construct the well head, and lay the water pipes. The work was done very well, and the water system now efficiently delivers plenty of water to the hospital and the surrounding area. We thank the Engineering Ministries International team, the men who implemented the plan, and the people who donated to make it possible. Miracles continue to surprise me in the world of medicine…maybe they shouldn't anymore. Last week I received a call at 5am that a patient who had received a cesarean section in the middle of the night was having heavy bleeding and my assistance was needed. 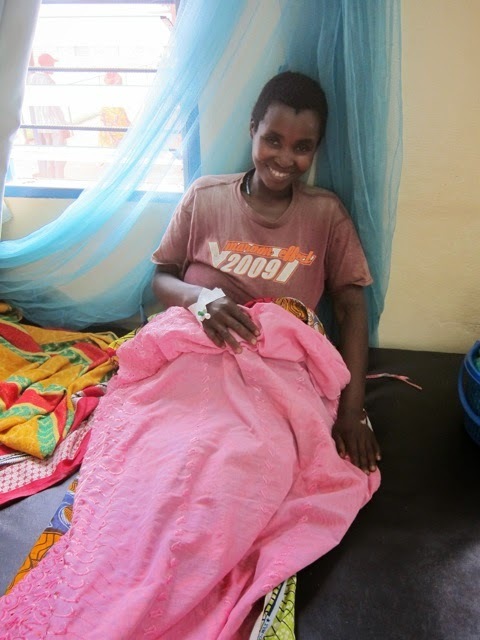 I came up to evaluate and found out that she had been transferred to Kibuye with a dead baby and and an actively hemorrhaging placenta previa (a problem where the placenta covers the cervix and a normal delivery is impossible and potentially fatal for mom and baby). One of my colleagues had done a C-section for her in the middle of the night and he told me that there had been "a lot of bleeding" but by the end of the surgery the bleeding had stopped. Now she was having a lot of vaginal bleeding, not necessarily signs of bleeding into her abdomen. I've seen several cases where patients have a hemorrhage after a previa because the site where the placenta had attached to the uterus continues to bleed. The uterine muscle is located mainly at the top of the uterus and can't "clamp down" as well near the cervix to stop this kind of bleeding. I put several catheters into her uterus to compress the bleeding site and asked the nurses to check her hemoglobin. An hour or so later, while I was sitting in the middle of teaching rounds with nursing and medical students, the nurse came in and handed me the results. It took a few looks for the result to sink in. Her hemoglobin, a measure of how much blood (and therefore oxygen carrying capacity) remains in the body, was 0.5. I have NEVER seen such a number. Normal is 12-16. Most people are dead if they lose this much blood. Less than 4-6 is an emergency, even in our setting. The complications began. It was obvious the patient needed blood. RIGHT NOW. She was virtually comatose and still having some vaginal bleeding. Our blood bank was empty. 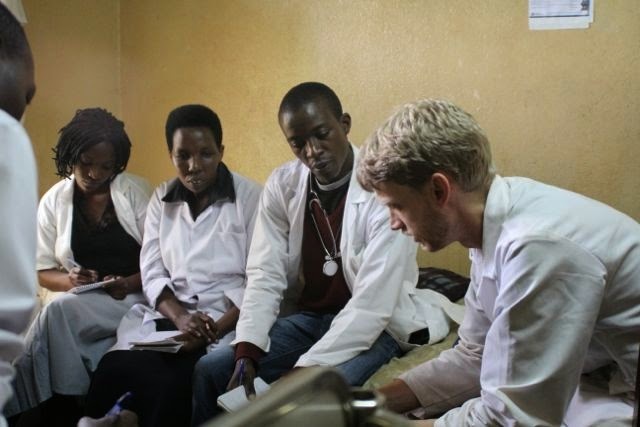 We called Gitega, the nearest bigger hospital (30 min away) about transferring the patient for a transfusion and better management. They had blood available, but were out of the reagent to test for hepatitis on the blood, so they would not release the blood to anyone. Many phone calls and much discussion ensued. It was decided we could send the patient and the hepatitis reagent to Gitega, so they could check the blood and give it to her. Excellent. One more problem, though. The ambulance (our only means of transporting her) was out of gas. What? Another series of phone calls and discussions ensued. There was more gas, but no one had the key to the room where the gas was kept. The man with the key was "not here." (in classic African fashion) I pulled out my hair. I thought about kicking the wall. I resorted to (what should have been my first thought) prayer. The patient kept breathing. The man with the key showed up. The ambulance left for Gitega. I breathed a sigh of relief. We got a call from Gitega that they would not accept the patient because she didn't have the $12 needed for a transfusion. Someone made some other calls to higher ups. Nine hours after my first 5am call, my nurse found me. The patient was still alive. She had gotten one unit of blood and was now being sent back to us. WHAT?! She needed at least 4-5 units! Fortunately, Gitega did send a few more units of blood back with her, so we kept on transfusing. She woke up and stopped bleeding and when I saw her on the second day after her surgery, she was sitting up and smiling. I sent her home yesterday. Miracle. At our hospital, there are a lot of bare feet. There are also a lot of open-toed shoes worn by medical professionals. Lastly, there are special close-toed shoes you can put on if you are going into the operating room. At our hospital, there are sometimes goats. Not big ones usually, but little black goats, inside the hospital grounds, skipping in between the buildings. Someone is usually following them, to get them out. But they are there nonetheless. At our hospital, there is no parking lot. This is because there are remarkably few cars. Most people arrive at the hospital by walking. If they cannot walk, they will sit on a bicycle, while their family pushes it, or maybe be carried in a hand-made litter with poles. At our hospital, jeans are “dress clothes,” because they are fancy, I guess. I’m not arguing. At our hospital, the nurses will sit outside the pediatrics ward to work on putting a new IV in a child, because it’s simply not well-lit enough inside. At our hospital, we needed to check a lady for protein in the urine, but we had run out of test strips in the lab. Then we remembered that another patient of ours had bought some test strips for his diabetes (from a nearby town), and those strips checked both sugar and protein in the urine. So our diagnostic plan for the day was to ask the second patient if he wouldn’t mind giving one of his strips to the first patient to check for protein. He didn’t mind at all. 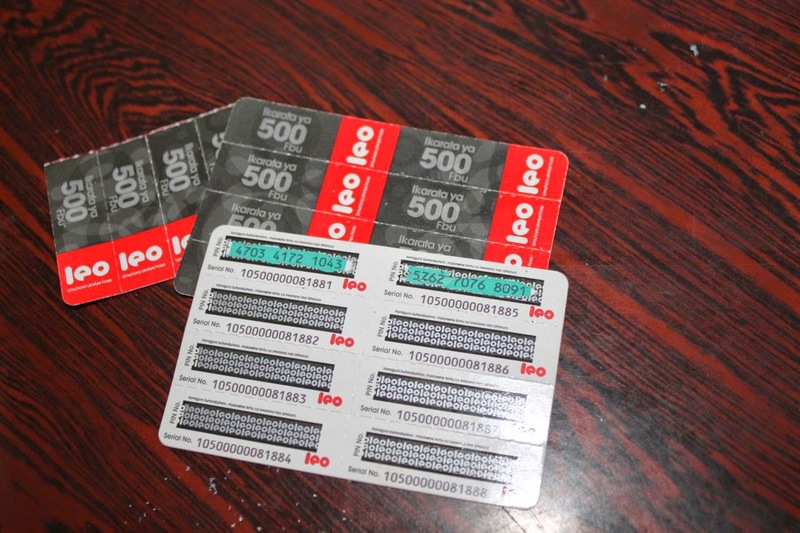 At our hospital, there are not many shops in the neighborhood, but you can buy scratch cards to add minutes to your mobile phone. The story is that, a while ago, a certain woman was brought to the hospital paralyzed and then abandoned by her family. In the face of this difficult situation, the hospital eventually decided to give her one of the private patient rooms, which is where she now lives, invariably in good spirits, earning her living by selling mobile phone minutes, 30 cents at a time, for honestly a pretty steep rate, but hey, she’s got a corner on the market. Pretty much all of these distinctives are the result, directly or indirectly, or poverty or scarcity, and our attempts to live life in the face of it. And there are disadvantages to each of them (e.g. there are reasons why US hospitals required closed-toe shoes), and if all goes well, I imagine some of these things will change. 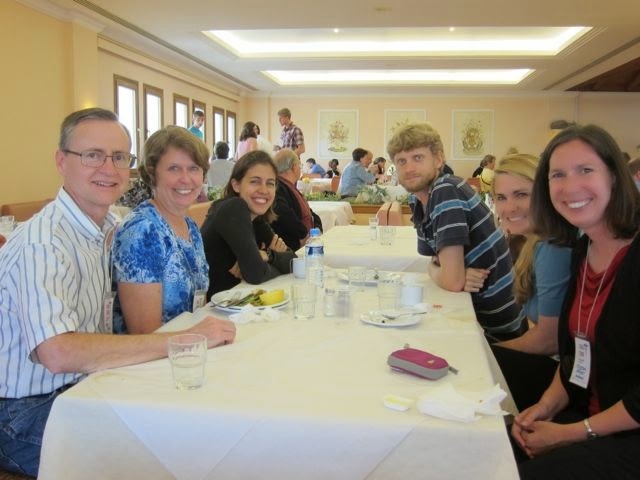 Fortunately for us the Christian Medical/Dental Association offers a yearly international conference of CME for medical missionaries working abroad. Every other year it’s held in Kenya (Thailand on the off years) but this year it was moved to Greece due to space constraints. Alyssa and the McLaughlins were able to go for two weeks at the end of April and it was great! 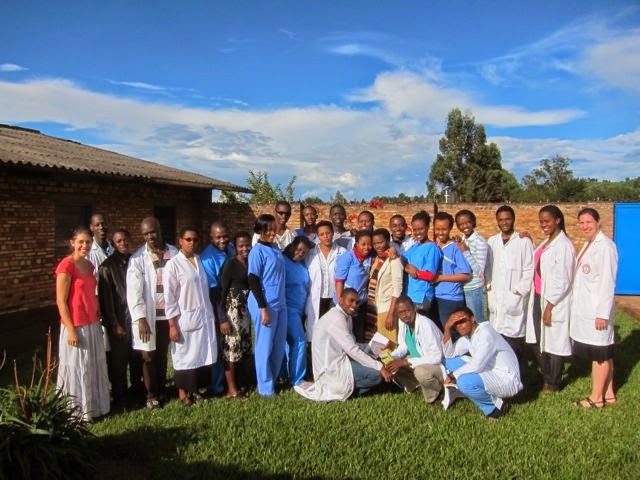 The first few days were especially important, as Alyssa and Rachel got extra training in how to teach management of neonatal resuscitation and obstetrical emergencies, and all three of us received hands-on instruction on a variety of ultrasound (cardiac echos, abdominal, diagnosing DVTs, etc). We got to attend lots of lectures on topics from tropical disease to updates in US medicine to community health and personal care. We also had daily worship and sermons (in English!) for spiritual growth. And then of course the highlight was visiting and catching up with friends from all over the globe--the world of medical missions is very small! There were actually over 700 people from 70 different countries attending. 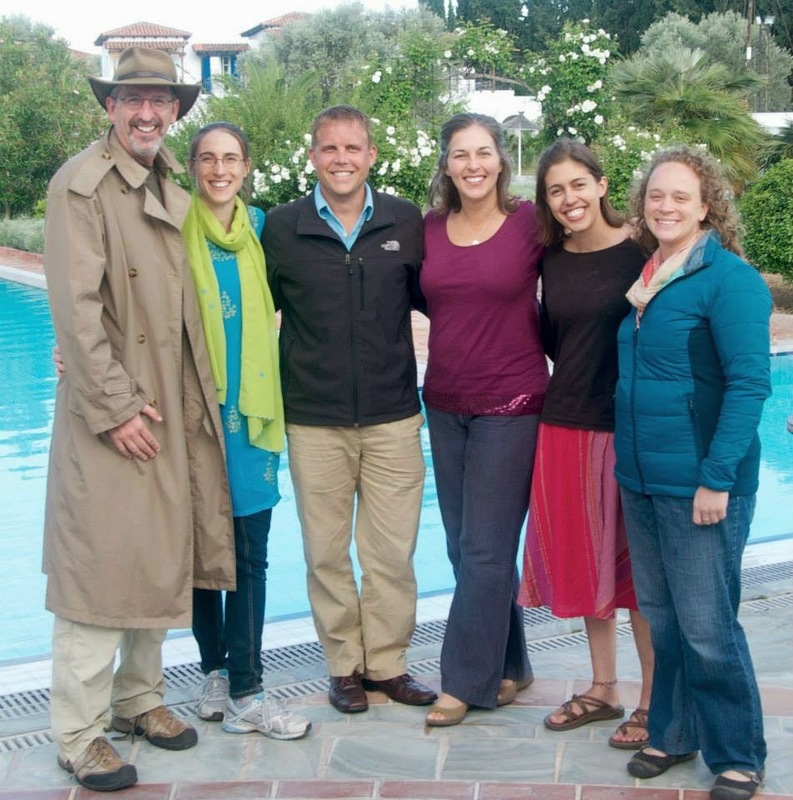 We caught up with friends from Tenwek, World Harvest/Serge, Loma Linda med school, former missionaries to Burundi, and even the couple who are currently living in our old apartment in Albertville, France! Shirley, a nurse in Kenya, worked at Kibuye for several years in the 1980s. Monica works with an NGO called LifeNet in Bujumbura. 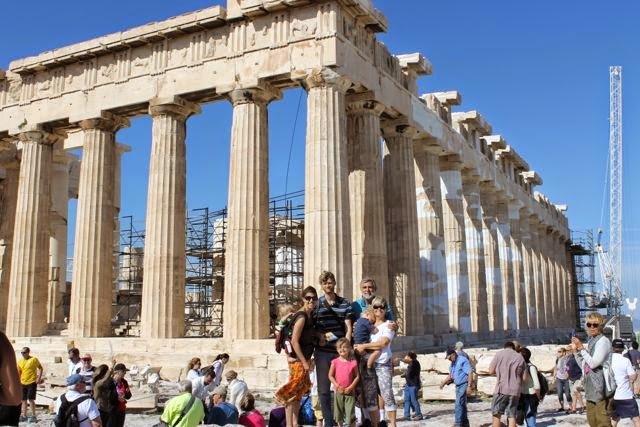 At the end of the conference, we took a few days to see Athens and experience Greece, a much needed vacation. Eric’s parents came to help out with the kids and visit, which was a special time as well. Thanks to everyone who helped make this possible for us! Anyways, one thing that we amazingly haven't really mentioned is our educational work. 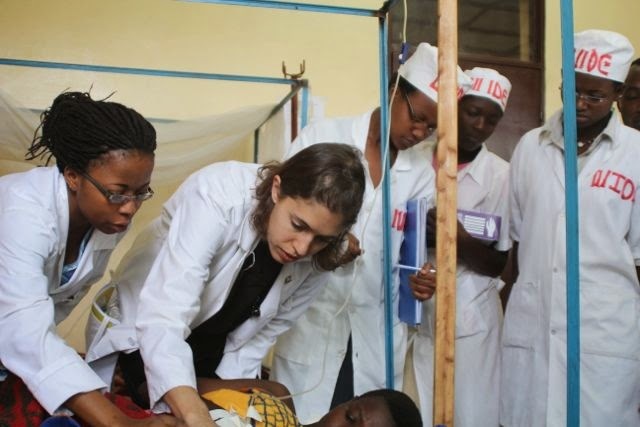 If you know about our team, you know that a big part of why we are here is to train Burundian medical students, with the central idea being that they will be able to effectively love, care for, and reach their country better than we will. Talking. Talking about physical exam. Talking about patient care decisions. Talking about any number of medical subjects. Answering questions. Asking them to repeat the question. Praying for our patients together. Learning new medical vocabulary. Since our start, we have given 5 lectures a week, which has been an ambitious linguistic challenge for all of us, since it means taking our medical training, translating into the appropriate context (i.e. what do they need to know here? ), and then translating it into French. The students are wonderfully patient. We are pleased to announce that we have officially increased the size of our team (and no, I am not pregnant)! A family and a single have recently been approved to join us here in Burundi. This fall, we are looking forward to welcoming Sherry* who will help with teaching our kiddos at Kibuye Hope Academy. She is a passionate, energetic, and hard-working young teacher with a heart for evangelism. We are thankful for her 1-year commitment to our team and praise God for how He answered our prayers for a teacher. *Given that she hopes to serve in a sensitive area overseas in the future, she would like to remain anonymous on the blog. A little further down the road, we will welcome Caleb and Krista Fader. Yep, you read that right...there are more Faders headed our way! Yippee!! Caleb (Jason's brother) is a civil engineer and Krista is a pediatric nurse practitioner. 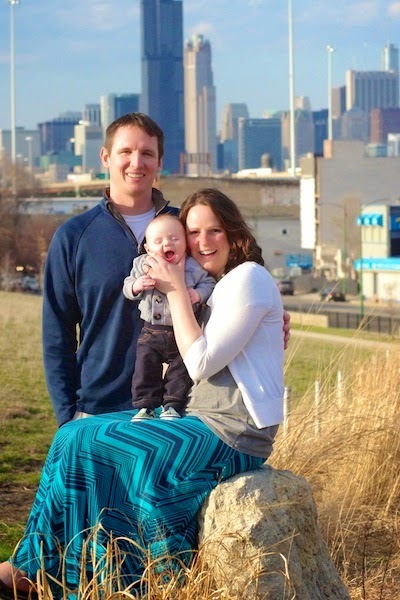 Both Caleb & Krista are missionary kids who grew up in Kenya and also have experience serving in Africa as adults. They visited us in February, along with their barely 6-week old firstborn, Liam. Although they were only here for a week, their visit "just happened" to coincide with an important water project that has significantly improved the availability of water at the hospital. 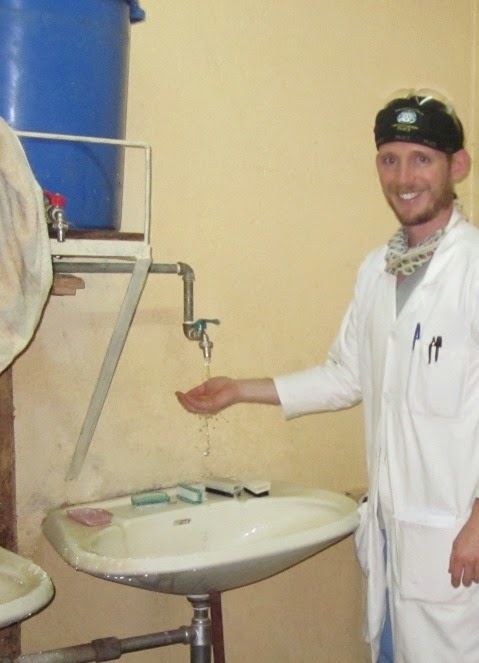 In the midst of so many projects, we have keenly felt the need for someone with Caleb's skills to work alongside the Burundians on building projects & hospital maintenance. Also, we hope that Krista will have the opportunity to be involved in nursing education at some point in the future. 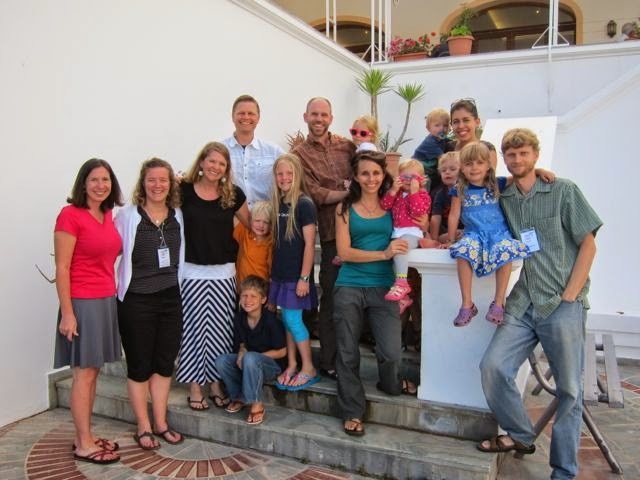 Please pray for Sherry & the Faders as they prepare to join us in Burundi. If you would like to partner with them financially in some way, see the information below. Each of them meet critical needs here and we are eager to have them join us as soon as possible. A financial gift to help them along their way would really be a gift to all of us on the team. In the fall, we will also be welcoming some short-termers. An anesthesiologist and his family (with 3 kids in our kids' age range) will be joining us for about 10 months. In addition, we are excited to host a high school graduate whose family is known and loved by all McCropders who have spent time in Ann Arbor. He plans to be here for about 6 months beginning in October to help with childcare & education for our kids. I was encouraged and challenged by a quote from C.S. Lewis that Sherry recently sent me. God has ordained and called each of these individuals to be involved in the life of our team and we look forward to seeing how He will change us and others through each of them! Every day in the field of medicine, we are confronted with suffering. Every day in life, probably, everyone is confronted with the fact that we live in a fallen, broken world, full of hurting and suffering people. Maybe it’s your own suffering, maybe the suffering of a friend, or maybe it’s the suffering of large groups of people you don’t even know, somewhere else in the world, and it weighs on your heart. Overall here at Kibuye, there have been some successes, but a lot of “failures”, people dying, not getting better, babies with malnutrition, etc. Sometimes people ask how we deal with it all. We’ve actually blogged a fair bit about dealing with suffering as Christian physicians in the past. Today I wanted to take a different tact and write about songs that have helped me process suffering. I love music, and I think emotions can be expressed and captured and healed through music in ways that just words alone can’t do. So I’ve complied my “Top 10 List of Suffering Songs.” Contrary to what you might be thinking, they’re not sad and melancholy. Some are slower and heart rending, but some are a “stand up and scream at the top of your lungs that things are gonna get better” kind of songs. Hope you enjoy listening to a few. My cousin shared this song with me while I was in Kenya, and I have loved it from the first time I heard it. The words are simple, but the music is goosebump-inducingly beautiful. Things tend to make more sense in retrospect. And some things will never make sense here on earth. But if we believe that things happen for a purpose, that God can use ANYTHING for his glory, then maybe we can cheer up. Maybe we can look forward with hope instead of gloom. This is a turn up the volume and belt it out kind of song, which I’ve been doing with this song since I first heard it in 2004. Sometimes you just need to sing loud and remember that Someone else is fighting on your side. Eric first played me this song weeks after Ben was born at Tenwek, and I immediately started crying. There were and still are so many days when I feel like this. Nothing is working. Everything falls apart. What am I doing here? And this song helps me to remember that God calls me to rest in Him, to find my worth and identity in Him, to simply....trust. This song also has a line that goes “She can handle any tragedy that comes her way but not little things like this,” referring to a line about spilling your coffee on the way to work. Sometimes my days seem like that. Send me something big and awful and I can rise to the occasion, but when my kids are screaming or I spill dinner on the floor it just seems too much. But big or small, God is coming. He is here and He is renewing everything. Not a month goes by that there’s not some big news in the world about a gunman or a bomber. And everyone wonders what’s going on in the world and how much “worse” everything is than it used to be. But that doesn’t mean that the darkness is winning. Love will ALWAYS win. Most people in Christian circles know the story of Steven’s young daughter dying. He writes this song from real life experience, and at the end of it all, he can acknowledge that it hurts and it shouldn’t be, but we’ll understand at the end and sing Holy is Our God because of it. I could have chosen another dozen Andrew Peterson songs or so, but settled on this one. A powerful retelling of the Abraham-Isaac story that really shone new light on a familiar tale for me. What was going through Abraham’s head when God asked him to sacrifice Isaac? I guess I never thought about it before, that maybe this hero of the faith would have just said, ok God, I trust you. But what if he said, “oh, God, not this. You are sovereign and you can do what you need to do in my life, but please not this.” Because sometimes that’s what I say, too. "Even if the boy dies, keep on beating the path to God's door, because the one thing you can be sure of is that down the path you beat with even your most half-cocked and halting prayer the God you call upon will finally come, and even if he does not bring you the answer you want, he will bring you himself. And maybe at the secret heart of all our prayers that is what we are really praying for." I hope you’ll get a chance to listen to some of these favorites, and I hope that they are able to provide some peace and healing the way they have for me.